Ludwig van Beethoven (Baptised: 17 December 1769 Bonn me (Janam ke tarik nai pataa), maut: 26 December 1827 Vienna me) ek German composer rahaa. Uu classical music likhat rahaa piano, orchestra aur duusra rakam ke Musical instrument khatir likis rahaa. Uske sab se jaada jaana jaawe waala kaam fifth aur ninth symphony aur piano piece Für Elise rahaa. Jab uu chhota rahaa tab uu ek achchhaa pianist rahaa. Beethoven dhani log ke saathe Vienna, Austria me bahut popular rahaa. 1801 me uu bahira hoe lagaa aur dhire dhire ii aur kharaab hoe gais "Ludwig van Beethoven's Biography". Retrieved 24-05-2009. Check date values in: |accessdate= (help)</ref> aur 1817 talak uu puura bahira hoe gais. Jab ki uu concerts me nai bjae sakat rahaa, uu music likhte rahaa. Beethoven, Flemish musician, Lodewijk van Beethoven (1712–1773) ke potaa rahaa . 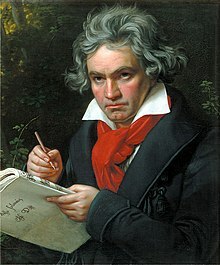 Beethoven ke naam uske aaja Lodewijk se aais hae jon ki Dutch me Ludwig hae. Beethoven ke aaja ek bass singer rahaa. Uske lage ek larrkaa rahaa, Johann van Beethoven (1739–1792), jon ki ek musical establishment me piano and violin ke sikchha dewat rahaa. Johann married Maria Magdalena Keverich in 1767; she was the daughter of Johann Heinrich Keverich, who had been the head chef at the court of the Archbishopric of Trier. Beethoven ke janam Bonn me bhaes rahaa; uske ek Roman Catholic service me 17 December 1769, me baptise karaa gais rahaa. Children of that era were usually baptized the day after birth; and it is known that Beethoven's family and his teacher Johann Albrechtsberger celebrated his birthday on 16 December. While this evidence supports the case for 16 December 1769 as Beethoven's date of birth, it cannot be stated with certainty as there is no documentary evidence of it (only his baptismal record survives). Of the seven children born to Johann van Beethoven, only the second-born, Ludwig, and two younger brothers survived infancy. Caspar Anton Carl was born on 8 April 1774, and Nikolaus Johann, the youngest, was born on 2 October 1776. ↑ Thorne, J. O. & Collocott, T.C., ed. (1986). Chambers Biographical Dictionary. Edinburgh: W & R Chambers Ltd. p. 114. ISBN 0550180222. Joseph Kerman; Alan Tyson (and others). L.Macy. ed. grovemusic.com, subscription access Beethoven, Ludwig van. Grove Music Online. http://grovemusic.com/ grovemusic.com, subscription access. Albrecht, Theodor, and Elaine Schwensen (1988). More Than Just Peanuts: Evidence for December 16 as Beethoven's birthday. The Beethoven Newsletter. p. 60-63. Bohle, Bruce, and Robert Sabin (1975). The International Cyclopedia of Music and Musicians. London: J.M.Dent & Sons LTD. ISBN 0-460-04235-1..
Clive, Peter (2001). Beethoven and His World: A Biographical Dictionary.. New York: Oxford University Press. ISBN 0-19-816672-9. Davies, Peter J. (2002). The Character of a Genius: Beethoven in Perspective.. Westport, Conn.: Greenwood Press. ISBN 0-313-31913-8. Davies, Peter J. (2001). Beethoven in Person: His Deafness, Illnesses, and Death.. Westport, Conn.: Greenwood Press. ISBN 0-313-31587-6. DeNora, Tia (1995). Beethoven and the Construction of Genius: Musical Politics in Vienna, 1792-1803. Berkeley, California: University of California Press. ISBN 0-520-21158-8. Geck, Martin (2003). Beethoven. London: Haus. ISBN 1-904341-03-9 (h). ISBN 1-904341-00-4 (p). Hatten, Robert (in English). Musical Meaning in Beethoven. Bloomington: Indiana University Press. pp. 372. ISBN 0-253-32742-3. Kropfinger, Klaus (2001). Beethoven. Verlage Bärenreiter/Metzler. ISBN 3-7618-1621-9. Russell Martin (2000). Beethoven's Hair. New York: Broadway Books. ISBN 978-0767903509. Meredith, William (2005). The History of Beethoven's Skull Fragments. The Beethoven Journal. p. 3-46. Morris, Edmund (2005). Beethoven: The Universal Composer. New York: Atlas Books / HarperCollins. ISBN 0-06-075974-7. Rosen, Charles (1998). The Classical Style: Haydn, Mozart, Beethoven. New York: W. W. Norton. ISBN 0-393-04020-8 (hc). ISBN 0-393-31712-9 (pb). Solomon, Maynard (2001). Beethoven 2nd revised edition. New York: Schirmer Books. ISBN 0-8256-7268-6. Solomon, Maynard (2003). Late Beethoven: Music, Thought, Imagination. Berkeley: University of California Press. ISBN 0-520-23746-3. Stanley, Glenn, ed (2000). The Cambridge Companion to Beethoven. Cambridge: Cambridge University Press. ISBN 0-521-58074-9 (hc). ISBN 0-521-58934-7 (pb). Thayer, Alexander Wheelock (1866-1908). Ludwig van Beethoven's Leben. 5 vols. (vols. 4 and 5 posthumously ed. by Hugo Riemann). Berlin. Thayer, Alexander Wheelock. rev. and ed Elliot Forbes. ed. Thayer's Life of Beethoven.. 2 vols. Princeton: Princeton University Press. ISBN 0-691-09103-X.